"What happens when you take a group of intelligent people and ask them to, well, go ahead and change the world?" 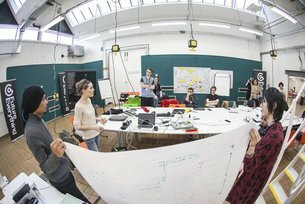 Bhavani Esapathi blogs about being part of The British Council/ FutureEverything Global FutrLab. So we all want to change the world, that’s the dream and what happens when you take a group of intelligent people and put them together for a week asking them to, well, go ahead and change the world? That’s exactly what we did at the Global FutrLab. We weren’t businesses, we weren’t individuals, we weren’t simply random people but people with a mission. Our missions ranged from saving the planet from energy crisis to preserving indigenous cultures or even just throw on a hat and explore the universe but our missions matter and that’s why we came together. My mission? To transform the way disability is received within our social economy; I was told during the workshop that mine is a “big ask” and was that overwhelming? Yes, but it only revealed the long road ahead of me more than anything else. I’ve come away from the Lab and these very same questions keep recurring, except it doesn’t feel so safe anymore to be comfortable with the “big ask”. That’s when I realised it was the s-p-a-c-e created very meticulously for us by The British Council, FutureEverything and Strange Telemetry during the week that made it comfortable to ask these very excitingly, awkward questions that we might not have allowed ourselves to otherwise. That’s exactly why everyone must escape into a lab time and again, to create something new, to build something that the world is calling out for and discover what you are truly capable of doing. What do international Labs do? They basically give you permission to explore your curiosities and NOT be afraid to fail. We take it for granted in everyday life that confidence means everything but having the permission to fail is priceless. On the second day we got together in building apocalyptic worlds just to see if our projects really mattered, if anyone cared when the world was in absolute chaos. If you’re thinking about starting a business and want to hire a risk assessor, trust me - this is a much more viable, more efficient method of throwing yourself out there and learn more about yourself as an individual and as a business. The experience has been priceless for lack of a more glamorous word, what do I take away from it when I look back? 5. All you need to benefit from the Lab is have an idea - have no expectations of the future- the experiment is to explore all possible sources of growth and implement it with the collective knowledge of minds from around the globe. So, what am I going to do now? Chronically Driven has received much attention from press, individuals and health organisations who genuinely want to make a difference and, just like the Lab taught me, I’m opening this up to you now - you have the opportunity to make a difference to the world. Contribute to the narrative and have your story heard by an international network, tell a friend about the project and help more people discover what could truly change their lives or simply drop me a line on how you feel about the project. The future is a work in progress and the process is pleasantly never-ending because we can always do something bigger and better. Bhavani Esapathi is a Digital Innovator and Founder of Chronically Driven, a social innovation project bringing real stories told by real people on ways their chronic diagnosis has led them on an extraordinary path of greatness. She can be found on Twitter as @bhaesa. You can get in touch with her directly by going to The Bhaesa Times.